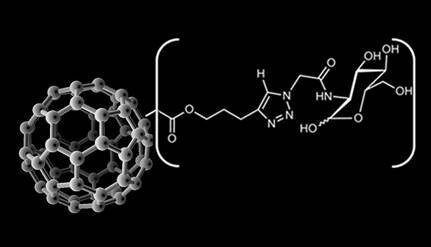 (Nanowerk News) Materials resulting from chemical bonding of glucosamine, a type of sugar, with fullerenes, kind of nanoparticles known as buckyballs, might help to reduce cell damage and inflammation occurring after stroke. A team from the Max Planck Institute in Germany has tested this on mice, opening the door to potential new drugs for the cerebrovascular accident. What the researchers have done is chemically bond the two compounds to produce what is known as 'glyconanoparticles'. These have subsequently been administered to laboratory rats which then had a cerebrovascular accident induced. The results, published in the journal Experimental Neurology ("Fullerenols and glucosamine fullerenes reduce infarct volume and cerebral inflammation after ischemic stroke in normotensive and hypertensive rats"), conclude that this combination of fullerene derivatives and glucosamine reduces cell damage and inflammation after a stroke, according to the MRI scans of animal brains and the improvement of their neurological symptoms. "Our study confirms that it is possible to couple fullerenes with sugars in order to combine their protective effects and in this way, to obtain new materials which may help to prevent and to treat Stroke," says Guillermo Orts-Gil, a Spanish researcher at the Max-Planck Institute of Colloids and Interfaces (Germany) and co-author of the research. "Although the present study was carried out on mice, the results indicate that these sweet buckyballs are potential new drugs for treating Stroke also in humans. However, this must be taken with caution, since what works in mice does not necessarily will work in the same way in humans," declared Orts-Gil. This work is the continuation of another previous piece of research, published last year in the journal 'Nano Letters', in which the researchers also confirmed that a protein called E-selectin, linked to the chain of events that occur during a stroke, is distributed throughout the brain and not only in the area where the stroke originates, as previously thought.